Hurricane Maria made landfall near the city of Yabucoa, Puerto Rico, at around 6:15 am Wednesday, according to the National Hurricane Center, battering the densely populated eastern side of the island with torrential rains and 155 mph gusts as hundreds of thousands of people hunkered down in one of the island’s 500 storm shelters in hopes of riding out the second major hurricane to impact the island within two weeks. Category 4 Maria slammed the island with winds of 155 mph, just 2 mph short of category 5 status. The island’s governor has said the hurricane will likely cause “catastrophic” damage to the island’s power grid and infrastructure, much of which has yet to be repaired following Hurricane Irma, which didn’t make landfall in Puerto Rico, but passed close enough to cause $1 billion in damage. As Bloomberg points out, Maria is the fourth major hurricane and 13th storm in the Atlantic this season that’s wreaked havoc from Texas to the Caribbean and left dozens dead. According to the NHC, the storm made landfall around 6:15 a.m. The NHC has instituted hurricane watches and warnings for many of Puerto Rico’s neighboring islands. Puerto Rico Gov. Ricardo Rossello is saying Maria is “potentially most catastrophic hurricane to hit” the U.S. territory in a century. Rossello said up to 25 inches of rain could fall in some areas and he urged anyone in a flood-prone, mudslide-prone or coastal area to leave. The NHS expects the storm to cross Puerto Rico on Wednesday and then move just north of the coast of the Dominican Republic later in the night and on Thursday. Maria had earlier battered the hurricane-ravaged Caribbean island nation of Dominica on Tuesday, devastating the island, according to the island’s governor, Roosevelt Skerrit. “It is devastating, indeed, mind boggling,” Roosevelt Skerrit, Dominica’s prime minister, said in a statement. The eastern Caribbean nation with a population of 75,000 has “lost all what money can buy and replace,” he said. Skerrit said he was rescued after the roof of his house was torn off by the storm. At least six people have died on the island of Dominica, according to a spokeswoman for the government in London. “Damage is extensive throughout the island,” she said, “and people are walking the streets in a delirious state of mind.” With all lines of communication down, the government was relying on amateur radio, or ham radio, operators for updates, according to Bloomberg. In addition, at least two have been confirmed dead on the island of Guadeloupe. Many Puerto Ricans were busy reinforcing their homes with plywood and other supplies ahead of the anticipated landfall. 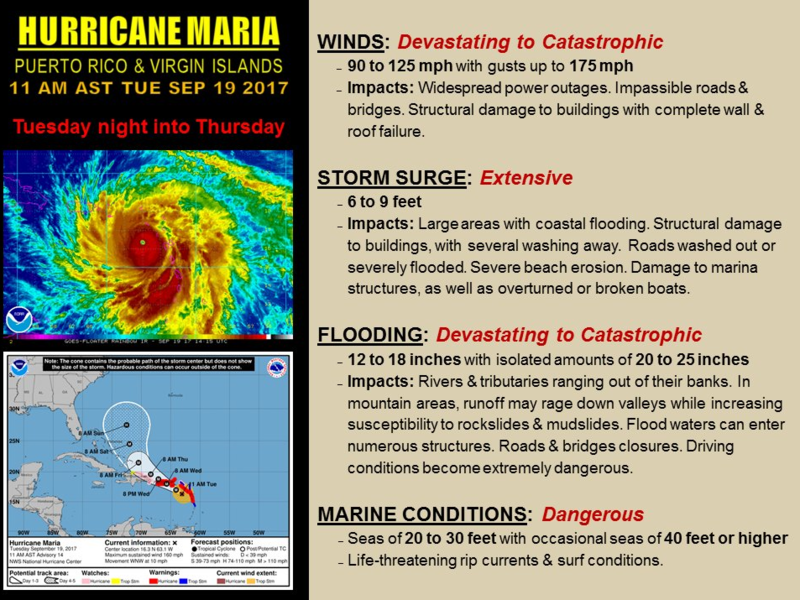 Maria could cause $30 billion in damage to Puerto Rico and the US Virgin Islands, according to Chuck Watson, a disaster modeler for Enki Research. The island, which filed for bankruptcy in May after years of economic decline while a series of defaults, has been effectively shut out of capital markets, which could slow the recovery process, Bloomberg reports. Its aging government-owned electric utility operates under court protection from creditors and its emergency fund stood at about $32 million before Irma knocked out electricity access for hundreds of thousands of Puerto Ricans. It could plunge “their not-all-that-robust electric grid into a pit of despair,” Watson said. A dangerous storm surge of as much as 9 feet is expected along the coast of Puerto Rico, and according to NHS data, water levels have already risen precariously. Meanwhile, vacationers and honeymooners visiting the island confronted a troubling reality earlier this week: With flights quickly filling up ahead of the storm, many tourists found themselves stuck on the island, forced to ride out the hurricane in whatever hotel or accommodations they had booked. Heather Farrell, a visitor to the island, is on her honeymoon with her husband Luke. They were married on September 9. She says that they had tried to cut their trip short when it became apparent that they were in Maria’s firing line. She said that hotel staff had asked that all guests that are staying at the hotel come downstairs early Wednesday morning to a safe room that they have set up for them. “I would rather be home than here but I guess we’re making the best of it,” she said. According to CNN, calls for rescue immediately started pouring in. But first responders weren’t expected to be able to help immediately because they’d been ordered to head indoors when sustained winds reached 50 mph. Thousands of Puerto Ricans did obey calls to seek refuge in emergency shelters. “As of 2:30 a.m. we count 10,059 refugees and 189 pets (in shelters),” the island’s governor, Ricardo Rosselló, tweeted. A las 2:30AM, contamos con 10,059 refugiados y 189 mascotas. Maria became the first category 4 hurricane to hit the island – which presently has a population of about 3.3 million people – in about 80 years. Conditions were expected to worsen between 8 am and 9 am ET Wednesday, when the storm’s eye wall – typically the part of the storm with the most powerful winds – is expected to reach island’s eastern coast. The Puerto Rico Convention Center in San Juan – which was still housing Hurricane Irma evacuees from other Caribbean islands – prepared to accept thousands more residents. The storm is likely to break all previous records, according to CNN meteorologist Derek Van Dam said. “This could potentially be the strongest hurricane to ever reach the shores of Puerto Rico,” he said from San Juan, Puerto Rico’s capital. According to Bloomberg, most long-range models keep Maria away from the US coastline after it passes through the Caribbean and the Bahamas this week, said Shane Mill, a meteorologist at MDA Weather Services in Gaithersburg, Maryland. “But I am not comfortable saying the entire East Coast is out of the woods yet,” he said.